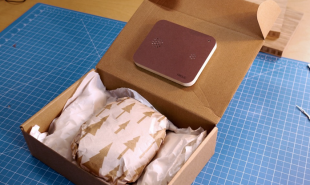 A new packaging system called Omni Present, from interactive agency Frolic, can help friends and family share the experience of a long distance gift’s arrival, by automatically calling the gift giver when the receiver opens their present. We have already seen a Smart Christmas Card from 02, which integrated a SIM card and mic and was rigged to phone the sender when opened. Frolic’s smart packaging system works in much the same way but enables gift givers to think bigger. Presents can be sent as usual through the mail. When the package is opened, light entering the box triggers the inbuilt electronics to telephone the sender and transforms the package into a make-shift mobile phone. The sender can receive the call, wherever they are in the world, and share the experience in real-time. Omni Present was created as part of Frolic’s problem-solving series — 24h Frolic, which sees the members of the Dutch start-up tackle small problems over the course of one day. Are there other ways of enhancing people’s gift giving experience?